Consider building a Party Favor Bar and letting your guests create their own chocolate party favor based on their own particular tastes. I absolutely love this idea! Your guests will be so pleased and, I suspect, will be drooling to get started. I know I would be. Instead of settling on one particular type of chocolate party favor, you can provide a whole smorgasbord of choices for your guests. It's simple - decide on the types of chocolate candy that you want to use for your chocolate candy party favor bar. chocolate covered peanuts, almonds, cashews, etc. novelty chocolates like coins, frogs, fish, hearts, sports balls, etc. These are just a few ideas to get your creative juices flowing. You can find these delicious chocolate candies in bulk at the Candy Warehouse, Candy Crate, Candy Crate. Now, what are you going to use as chocolate party favor containers? You could select favor boxes or favor bags and make them available for each guest to fill with their favorite chocolate choices. You will find different types and sizes of favor boxes and favor bags at Candyland Crafts and also at One Stop Candle. You can also get favor ribbons and other favor supplies at these great suppliers. I love browsing through their stock. 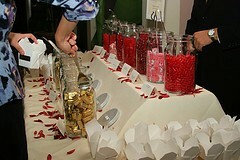 Once you've chosen your chocolate candies and favor holders, now all you have to do is set up your favor bar. 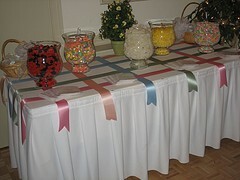 You can decorate a table to match your party theme or colors. Place your candy in jars or bowls around the table with a large spoon or scoop in each one for easy access. If you have similar looking candy choices, like chocolate covered nuts and chocolate covered espresso beans, it would be a good idea to label the selections with small place cards. Fan your boxes or bags in an attractive array for extra eye appeal. Depending on the amount of space available, you may want to scatter confetti, potpourri, or votive candles around the table for added color. Have A Chocolate Party Favor Idea? Go ahead and show off your creativity. We'd all love to see what you've done. Maybe you saw something extra special or super cute at a party or wedding that you attended. Do tell.. If you have a photo, all the better. Tell us about it in the form below. We'd even like to know any humorous or poignant details that make your story unique.